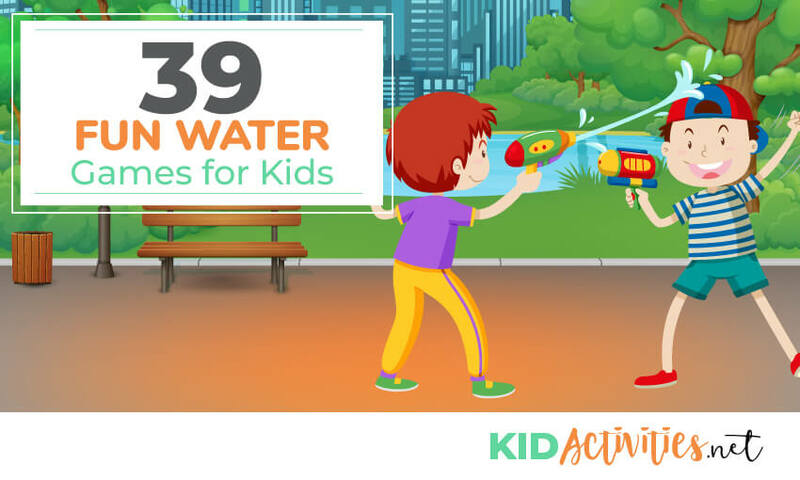 Here are more than 39 water games and activities sure to cool you and your kids!!! There are many ideas for all size groups (2 to 20 or more) and ages…just scroll thru and see! You may also be interested in ‘Water Themed’ Art, Craft, Science, Miscellaneous and Snack Ideas! The person who is “it” throws the wet water bomb to tag other players. If hit, they are the new “thrower”. This can also be played with many variations of the game such as Frozen Tag, etc. 2. A TWIST ON TRADITIONAL WATER BALLOON TOSS is making a small hole in each balloon, then filling the balloon with water and letting the kids toss the leaking balloon. It becomes a bit of a time bomb, as you don’t want to be the last one holding the balloon when it finally runs out of water! Quick, easy, and fun! Great for end of the year or Summer Camp!!! Set out bucket of water and a large sponges. Soak them in the bucket and then toss it back and forth with the children. 5. WATER RELAY…Put children into as many teams as needed. Fill one bucket for each team and place them at a beginning line where game will start; place plastic glasses or cups in the buckets of water. On ‘Go” kids scoop up a glass of water and run to a set far line where additional large containers have been placed. When the water is deposited, the child runs back to the next team member to continue play. The first team to fill the container with water is the winner. Have kids sit along the edge of a kiddie pool filled with water. Each player has their own empty bucket or bowl beside them. Now dump a big pile of ice cubes into the pool. At the starting signal, players must pick up as many ice cubes as they can and put them into their own buckets…they must use only their feet. 7. POP GOES THE WATER BALLOON! Play this similar to ‘Hot Potato’! Place children in a circle and set a timer (or music). When the timer goes off, the child holding the water balloon ‘pops it’ and splashes them self. As children ‘pop and splash’–they are out. You can reward each child with a simple candy/sucker as they leave the game. Set up a number of sprinklers in between a starting line and a finish line. Have the children try to run from one end to the other WITHOUT getting sprayed. Have one of the youth control the faucet, turning it ON AND OFF AT RANDOM. Divide the group into two (or more) teams. Have them form a single file line facing the person’s head next to them. At the head of each line put a bucket of water. At the other end put a plastic pitcher– with a line drawn on it. Give a sponge to the person at the head of the line where the water bucket is. That person has to dip the sponge in the water to soak in as much water as they can. They have to then pass the soaking wet sponge OVER THEIR HEAD to the person behind— who then passes the sponge to the person behind them THROUGH THEIR LEGS. UNTIL it gets to the person standing next to the pitcher. That person must squeeze whatever water is left into the pitcher and run the sponge back up to the head of the line. When that happens, everybody moves back one position– and the person who was at the back of the line now is at the head of the line. Continue process till the pitcher is filled to line. Fun game on hot day. The first player on each team is given an ice cube. 1. The child rubs the ice cube between his hands for as long as possible to try to make it melt. 2. When he or she gets too cold, the ice cube is passed to the next child in line. 3. The first team to melt the ice cube wins! 1. A twist on traditional tag, this game is played with a big soft sponge like the kind used to wash your car. 2. The player who is “It” must use the wet sponge to tag another player, who then becomes the new “It”. 3. There will be no doubt about who is tagged because they’ll be wearing a big wet splat mark on their back. You’ll need a bucket full of water balloons for this game. 1. Divide kids into two teams and pair them up. 3. One side begins by placing a water balloon in the center of their towel. The object is to toss the balloon from one pair of kids to another, with the opposing side catching the balloon in their towel. This can be played with a net, or simply pace off a distance between opposing teams. Have players stand or sit in a circle outside. A water balloon is passed from player to player; however, the balloon is not passed around the circle as in traditional “hot potato”. It is thrown across the circle from player to player. If a players fails to catch the balloon, or it breaks when he or she attempts to catch it, that player is out. If a player intentionally throws the balloon hard to make it explode in another’s hands, he or she is called “out”. Older kids can spread farther apart if necessary. The game proceeds until there is one dry person left. 1. Set up a water hose in a grassy area. 2. Line kids up as in traditional limbo. 3. An adult is in charge of the water hose, shooting a powerful stream of water for kids to limbo under. 4. Adult starts with the hose high, and then lowers the stream of water after each round. Losers, of course, get soaked! 5. Don’t forget the Limbo music on portable CD player!!! 15. GET COOL WITH A PINAQUA! A bandanna and a broom. When temperatures soar and the afternoon gets hot and sticky, beat the heat with the fun of a pinaqua. 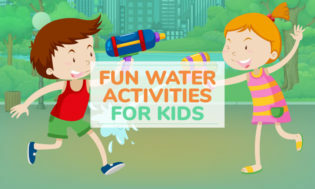 This activity, from the Family Fun Web site (familyfun.go.com), is similar to a pinata, but the players cool off by taking turns hitting a TRASH BAG FILLED WITH COOL WATER while blindfolded— rather than a pinata filled with candy! Have children dress in swimsuits so they are ready to get wet. Fill the trash bag with one or two gallons of water and then knot the bag. Tie one end of the rope beneath the knot, toss the free end over a tree branch or structure and then tie it securely. TO PLAY, each child takes a turn being blindfolded, gently spun a few times and then getting three whacks at the pinaqua with the broom. The winner is the one who manages to break the bag and unleash the tidal wave. • Another idea is to bunch together a large amount of filled water balloons! Follow the above directions and ‘whack away’! Next, blow the balloon up a little bit just so its half water and half air. Tie a knot to close the balloon. Take the rubber band and tie it on the end. If you want – decorate it with the markers. Have Fun! 4 buckets and a sunny day! Separate two teams evenly having children face back to back in a straight line. On a signal, the first player of each team dips a towel in a bucket filled with water. The wet towel then passes over each head of the people in line. The last person in line that receives the wet towel must ring it out into a bucket. Then that person runs to the front of the line, dips the towel into the bucket of water and passes it over the head of his/her team. It continues until the first person in line is in the front. The team that wins— is the one that has the most water in their bucket. To make it more challenging put a line on the bucket so they have a goal to reach. The game goes on until the first team reaches their mark. If the towel drops it must go back to the beginning of the line. If the team members do not pass the towel over their heads it starts over also. • Chalk or other markers to mark the start and finish line. • A black bag to collect all the balloon pieces when the groups are done. This relay race needs at least 2 teams with equal players (or the other team has 1 person go twice). The start and finish lines should be about 20 feet apart. Place the bucket of balloons at the start line in front of each team. When you say ‘go’ the first person grabs a balloon and runs to the finish line. When they reach the finish line then must sit on their balloon and pop it. The player then runs back to the start line and gives the next person in line a high five, and then they go… and so on… until the whole team is done. Make sure that the group picks up all the balloon pieces before moving on. You need: 2 buckets per team; one filled with water. 1 plastic baggie per team. Put a lot of pin holes in the plastic baggies. The groups line up sitting down, one in front of the other, so that they are facing the back of the person in front of them. The bucket that is full of water goes behind the last person; the empty bucket goes in front of the first person. When the race starts, the first person takes the baggie to the back bucket, fills it with water and then tried to get the water to the front bucket, but it has to be carried OVER THE HEADS OF his/ her TEAM MEMBERS. He/ she dumps the water that is left into the front bucket. The line shifts up and the first person sits in the back. The winner is whatever group has the most water in their bucket after the pre-determined about of time. Make sure that groups are not cheating by covering the holes – it might be best to say that they are only allowed to use one hand when passing the baggie. 1. Half fill a child’s pail (with handle) — with water. 2. Have children hold the pails in one hand—and hold that arm straight down by their side. 3. Keeping the arm straight, children swing the pail around and around in a circle. 4. No water should spill, if pail is kept moving like a windmill. 5. (Decide how many times the “windmill” will go around before the “next windmill” starts. • A few black bags to collect all the wet paper when the groups are done. Be sure to make sure that all the newspaper is cleaned up before the next group arrives. Have at least 5 water balloons per player. Divide into 2 groups on opposite sides of a line with each side having their balloons in a plastic tub. If you are hit with a water balloon you are out (like dodge ball). They are to do this while holding onto their cup of water and trying to do let any water spill. The child that has the most water left is the winner. “Dry, dry, dry, dry, dry, WET! A small cup of water is poured on the person’s head. Play continues just as in Duck, Duck, Goose! Duck, Duck, Goose–is traditionally a younger child’s game; however, with the water-school-age kids may find it fun!!! Kids (and grown-ups) sit cross-legged on the ground in a circle. When the player touches another player’s head and says “goose,” the “goose” must jump up and try to tag the other player. If that player can run around the circle and sit in the empty spot, he or she is safe. An obstacle course can be created as well. For a real challenge, if it is warm try adding and avoiding an oscillating sprinkler. Be sure to wear swim suits! Set up number of teams possibly by number of people willing to get wet. On each team, one person lays on ground while holding a 20-oz plastic pop bottle on their forehead. Teammates run to bucket to fill up their 4-oz cup then they attempt to pour it into teammate’s pop bottle while standing over head. Kids have a great time if you just fill up a small sized pool or two (How about three if you have several kids?) — set up the sprinkler between them and toss in cups, pitchers and containers! No pools? Put out the sprinkler! Take a portable BASKET BALL HOOP (outside of course!) and have the children toss water balloons through it! Throw from distances appropriate to children’s age. Kids love throwing water balloons-period! Give them a target such as a tree or ‘through the hoop’! Just the ‘splash’ of it is fun for younger kids. Hang up targets on trees or playground equipment. Targets can be made out of cardboard, paper plates, aluminum pie pans or anything creative. Assign different points to each target depending on position and distance. You can keep points by teams or individuals. When a target is hit they receive points for assigned target. 30. KOOL-AID PAINTING… Sprinkle unsweetened Kool-Aid on a piece a paper. Have the children move a piece of ice over the Kool-Aid. Watch as the Kool-Aid turns to liquid and makes a yummy smelling picture. 31. OUTDOOR WATER PAINTING… On a hot summer day give your children outdoor paint brushes and buckets of water. Let them paint the sidewalk, walls, etc. Save all those liquid dishwashing & ketchup plastic bottles. When empty, clean them up and make great “squirt each other” bottles! 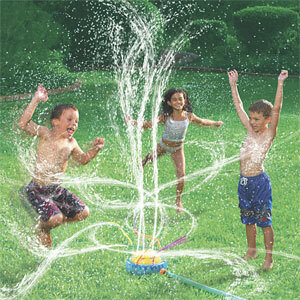 Marvelous for water fun! Add these to your wish list to parents to get a large supply! ARE YOU HAVING A SUMMER POOL PARTY? Have the children bring their swimsuits and towels to school to go outside for an hour or two (for summer day camp-children can go out in morning and afternoon both!) and take part in a variety of “water” stations. (Similar to a day of field activities). Stations could include beach volleyball, basketball hoop in a small child’s swimming pool, obstacle course (through a sprinkler, over hurdles, through tires, etc. 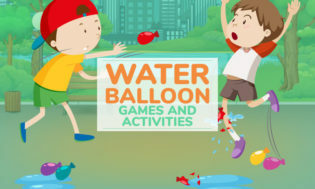 ), sprinkler limbo or sprinkler jump-rope (using the flat hoses with holes in them), filling buckets from a kiddie pool, water balloon activities including several relays, and tug-of-war. With activities finished— all dry off and change clothes so that no one goes home wet. A great way to cool off and have a lot of fun! SOME WATER STATION IDEAS TO GET YOU STARTED! The object is for team members to wade in a small pool and try to recover marbles with their toes –and place them in their bucket. Set up a summer themed obstacle course. Children place a water balloon under their chins and must negotiate the obstacle course without breaking the balloon. After a given time, the number of balloons successfully passed is tallied. The participants then try to beat their score. 37. BLIND SQUIRT BOTTLE FUN! 1. Each child has a partner. 2. They stand one behind the other. 3. The partner in front is blindfolded. This person also has a squirt bottle (cleaned out dish soap, catsup, water bottle, etc,). 4. The partner standing behind is not blindfolded. This person tells the blindfolded partner where to face, when to walk and in what direction, and when to squirt. 5. Keep a few large containers filled with water for easy refills. Player #1 runs to the bucket, puts on an XL T-shirt and returns to the next player. Player #1 takes off the shirt and passes it to #2. #2 runs to the other end, takes it off and places it back in the bucket and returns, etc. Practice this with the children BEFORE THE DAY in this manner- however, when they arrive to this station on Field Day, all of the buckets are filled with water and have “wet” T-shirts in them! This is a great activity and kids love the surprise! Keep broken balloon pieces away from young children. They can be a serious choking hazard!!! On that same note… the broken pieces also pose a threat to local wild life. Having a water themed day or week? Do you go swimming to a pool or lake during SUMMER CAMP OR DAY CAMP?